Cars, Castles, Dinosaurs & More! Unleash your imagination as you journey through the wide-ranging world of LEGO building with The LEGO Adventure Book. This inspiring tour is filled with bright visuals, step-by-step breakdowns of 25 models, and nearly 200 example models from the world's best builders. Learn to build robots, trains, medieval villages, spaceships, airplanes, and much more. Whether you're brand-new to LEGO or have been building for years, this book is sure to spark your imagination and motivate you to keep creating! Now Available: Volumes 2 & 3! Megan H. Rothrock is a former Product Designer for the LEGO Group and the author of the popular LEGO Adventure Book series, currently at three volumes and counting. She has displayed her models at ComicCon International, The LEGO Show in the UK, LEGO World NL, and many other LEGO events across Europe and the US. She is also the former European Bureau Editor for the LEGO fan magazine BrickJournal. This on-the-go toy designer and author of LEGO books is currently developing more LEGO fun for the future! "If you're a parent looking for an excuse to play with LEGO again, look no furtherThe Lego Adventure Book is all you'll need!" "This one certainly won't sit on shelves. A fun read for LEGO fans of all ages." "For any child who is into LEGO, this a great inspiration ideas book. . . . You can tell when an author is passionate about a topic, it really comes through, this book is a great example of that." "I would highly recommend this text for use in a project-based mathematics or science class." "Frankly, I have never seen a LEGO book that looks as wonderful as this one....I am looking forward to the further adventures of Megs." "If you are an adult fan of LEGO, or have a kid who loves LEGO, then you should buy this book." "I give this book my highest recommendation. The proper audience is just about anyone. The kid starting out will see this as inspiration of all the cool things you can build. The intermediate builder will enjoy reproducing the models. The long-time AFOL will love the celebration of the community, including popular builders and fan-created themes." "If there is one LEGO book you need to get this year it has to be this one as it's packed full of inspiration, it is fun to read due to the lay out, and I for one cannot wait until Megan does issue 2." "You will want this in your collection." "The images are bright and vibrant, and there are heaps of them! When you add extras like the hundreds of ideas and instructions included as part of the story, you create a purchase that will earn its initial cost over and over again." "The book is big, beautiful and most importantly, full of interesting and inspiring LEGO models." "I really enjoyed the variety of models chosen, and the excellent photography showing the construction techniques used." "The LEGO Adventure Book is both a welcome addition to the 'idea book' genre and easy to appreciate as a hard-copy document of some of the online LEGO community's best work." "I'm thrilled with nearly every aspect of this book. 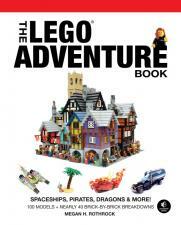 The LEGO Adventure Book is an excellent offering for builders of any age looking to expand their LEGO world with some new styles and models." "An incredibly well put together book with a ton of great builders showing off some of their most impressive creations. Even those who don't wish to use the instructions will likely enjoy the book on its own merits." "To say this book is nothing less than amazing would be a lie. It is outright fantastic."